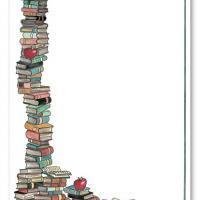 This blank card with a pile of heavy and thick books is perfect for the bookworm graduates. These printable graduation invitations are perfect for both announcements and invitations to to a great dinner, party or get-together to celebrate the event. Type the details of the gathering on these free printable invitations, print it out on a good card stock and enjoy. These invitations are just what you're looking for if you or your graduate loves books and wants something that reflects that. Print and enjoy today!